Skillets are amazing things. Considered trendy now, they have been an intricate part of kitchens for many years. The first known use of cast iron cookware dates all the way back to the Han Dynasty in China, around 220 A.D. By the 16th century, casting techniques became widespread in Europe, quickly thereafter this versatile equipment has been a staple in households all over the world. There are a few reasons why cast iron skillets (and cookware) has become so incredibly popular in recent years. The main reason is health concerns. Many non-stick coated pans were shown to emit toxic fumes when they are heated past a certain temperature. Cast iron lasts forever provided you care for it properly. Lastly, cast iron is visually appealing and being used more often for presentation purposes. As chef you don’t typically use cast iron, you use stainless steel. Because of this I was slow to come around to the amazing things a cast iron pan can do. But I got there, thanks to my husband. 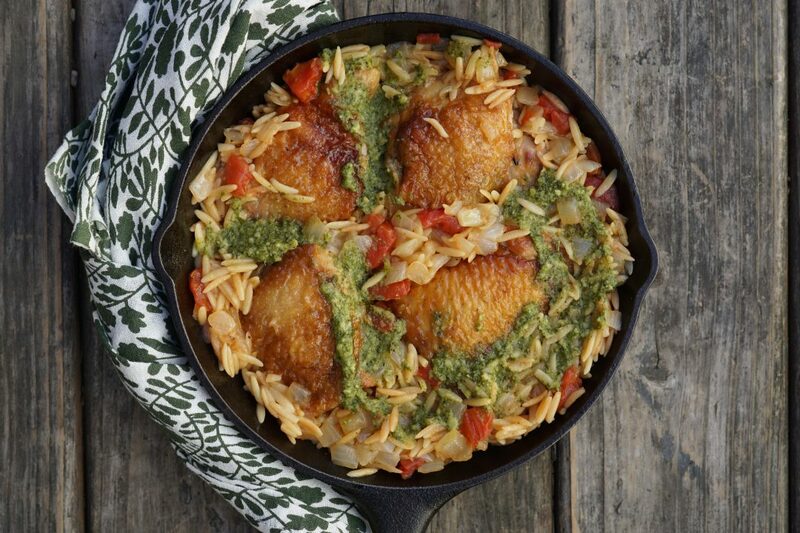 Skillets can do great things, sweet or savory and this skillet chicken with orzo and pesto is a fine example. 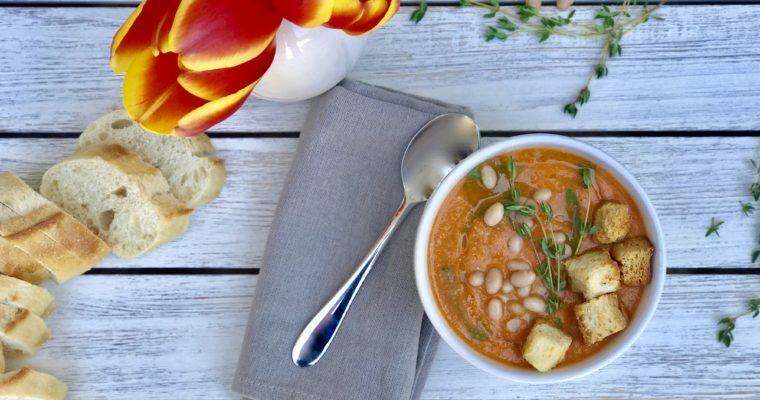 Simple, one-pot dinners that are almost effortless are great, go-to options for busy families. 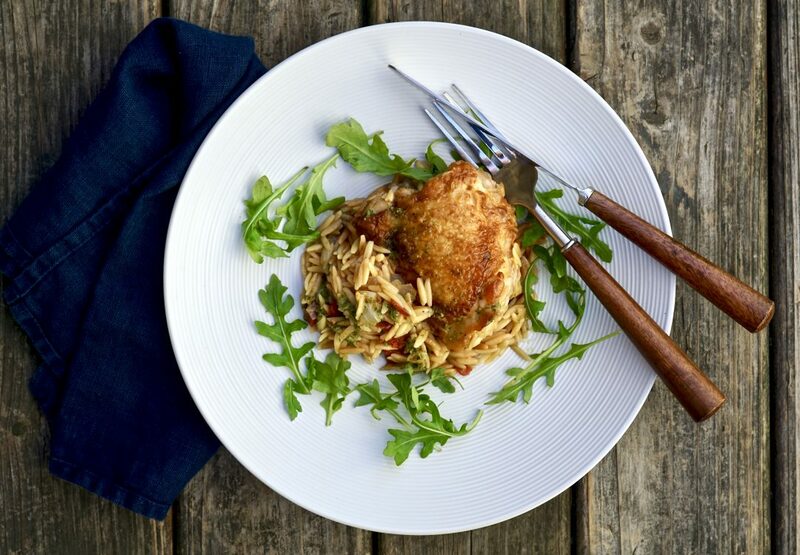 Made entirely stove top, the cast iron skillet makes the chicken in this recipe nice and crispy but without drying it out. Like a sheet pan dinner, this recipe is a great simple dinner which pleases most. 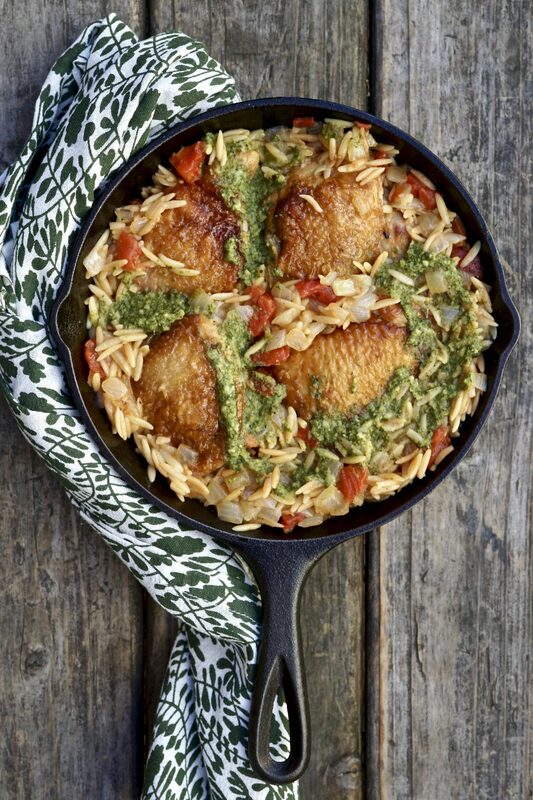 This recipe is actually a play on a dish my mom made when I was growing up which she called “chicken and rice“, it was straightforward and not fancy, but I always looked forward to having it. The same could be said for this recipe. So I’m dedicating this dish to my mom, who at 75, continues to inspire me daily. Step 1 Pat the chicken dry with paper towel and season the chicken on both sides with salt. Set aside. Step 2 Place the olive oil and butter in a large cast iron pan and place over medium-high heat. When hot, add the chicken (skin side down). Let cook for about 5 minutes or until the chicken has browned nicely. Using tongs, carefully turn the chicken and cook on the other side for an additional 5 minutes. 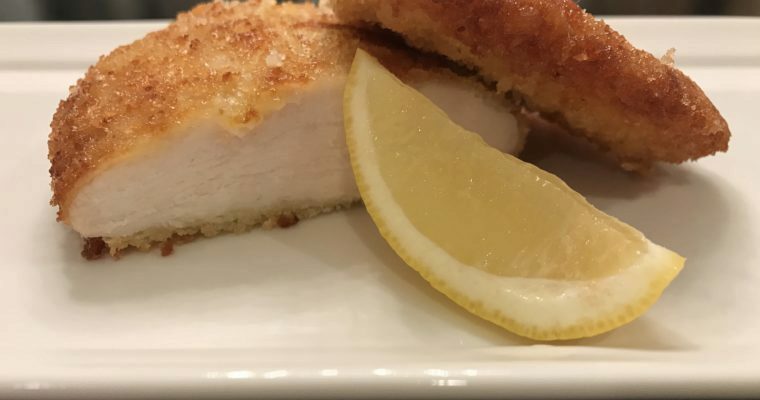 Remove the chicken from the pan and place on a plate near your work station. Step 3 Place the pan back over the heat and add the orzo, using a spatula, mix to coat and cook until the pasta begins to brown, about 2 minutes. Reduce the heat to medium, add the chopped onions and cook for an additional 2-3 minutes until softened. Add the garlic and cook 30 seconds longer. 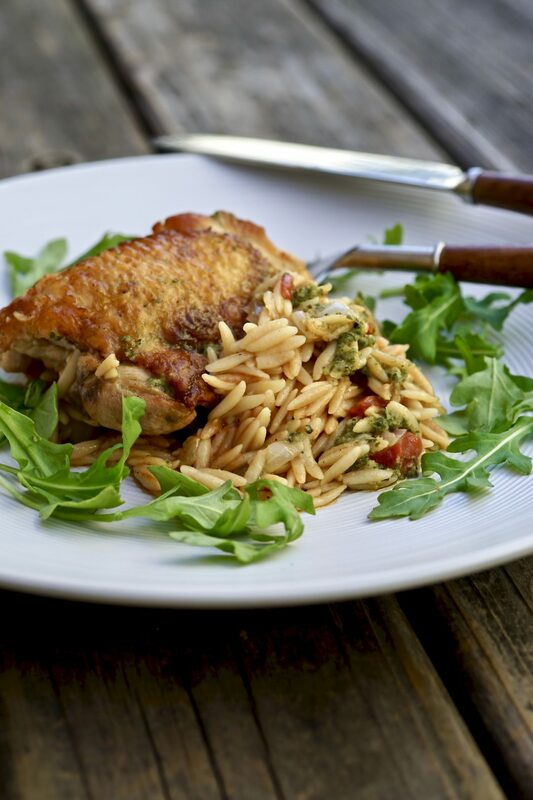 Step 4 Place the seared chicken in the pan with the orzo. Add the chicken stock, tomatoes, salt and pepper. Increase the heat back to medium-high and bring to a boil. Once boiling, lower the heat and bring to a simmer. Cover and cook until the orzo has almost absorbed all the liquid and the chicken is cooked through, about 15-20 minutes. Step 5 Remove the pan from the heat and swirl in the pesto. Cover again and allow to sit for about 5 minutes. Garnish with parsley (if using) and serve directly from the pan.